Our Etsy shop this week is brought to you by a mother daughter team, Dorothy and Brandi. B Doodles brings together the talents of both ladies to create bags, wallets and aprons. 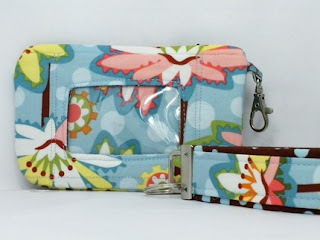 The items in their shop are made from some of the cutest fabric combinations and I know you all will love them! The perfect fit for your Blackberry or other electronic gadget, this bag also comes with a key fob. Custom orders are welcome as well. You will put June Cleaver and those other perfect moms to shame when you are cooking it up in the kitchen wearing this too cute apron! Mundane tasks always seem better when you are wearing a cute outfit! Just click on the link for photos of the reverse side of the apron. 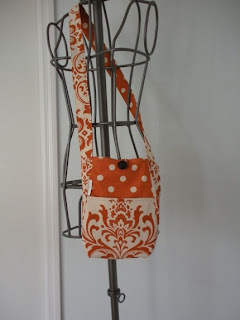 This burnt orange bag features a button closure and comes in the most perfect fabric combo. The not so often seen burnt orange-love! Polka dots-love! So just to recap, if any of my friends or family would love to buy me this for my 29Th birthday coming up in March please feel free! ;) Yes I did say 29. This is my blog and if I want to turn 29 six times then gosh darn it this is my forum to do so! So it may not be your 29Th birthday my wonderful readers, but it may be your lucky day this Friday. Start the new year off right by winning a prize! 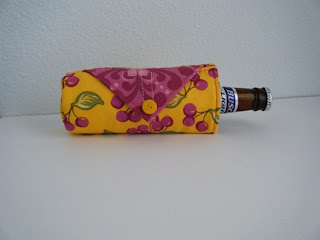 This week B Doodles is giving one of the lucky Joy De Vivre winners a bottle cozy like the one pictured above. There are multiple fabrics used in their shop to make the bottle cozy, so the winner this week will choose which design they would like to receive. 1. Visiting B Doodles shop and then leaving a comment here about which item is your favorite in their shop. If you can't choose a favorite, just come back and rave about them all! 2. Become a follower of Joy De Vivre. Not only will it be a reminder to check back and see if you are the winner this week, but you also never know what topics will come up! Good luck everyone! Check back Friday afternoon to see who the lucky winner will be! That is SUCH a cute shop!! The aprons are awesome! Thank you for the feature Heather. Awesome blog! Darling fabrics! All the items are precious but I think my favorites are the bags - who couldn't use another tote? I started following this blog, too. Fav. item would have to be the The Quilty Bag Urban Shamrock Awesome BUTTONS, not only am I irish but my parents got married on St. Patricks Day! Yay! Shamrocks! 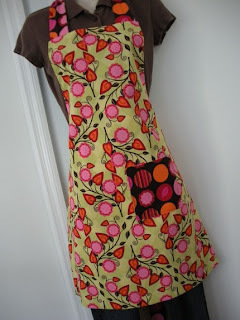 I love the cafe apron :) it has a cute, feminine bow but it's not so big it would get in the way. I love the brown Eye Glass Case! Blackberry Gadget Cozy Pouch Window with Key Fob Music Lovers Notes is so cool! wish there were makeup bag sizes too. Beer Bottle Cozy Water Bottle Cozy WOW 20 oz is CUTE! I love that they're all reversible! Oooh, I like the London Hipster Burnt Orange Mod Traditons and Dots. great colors and use of the print.